Work is progressing nicely on the upgrades to Aurora. 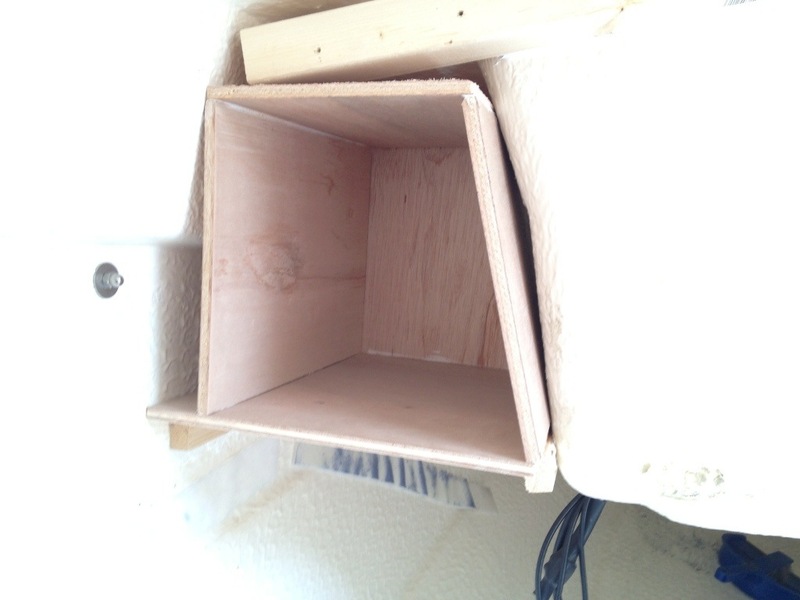 I have now finished the joinery for a storage unit and new control panel on the port bulkhead. Once they’re varnished, I’ll wire everything in. 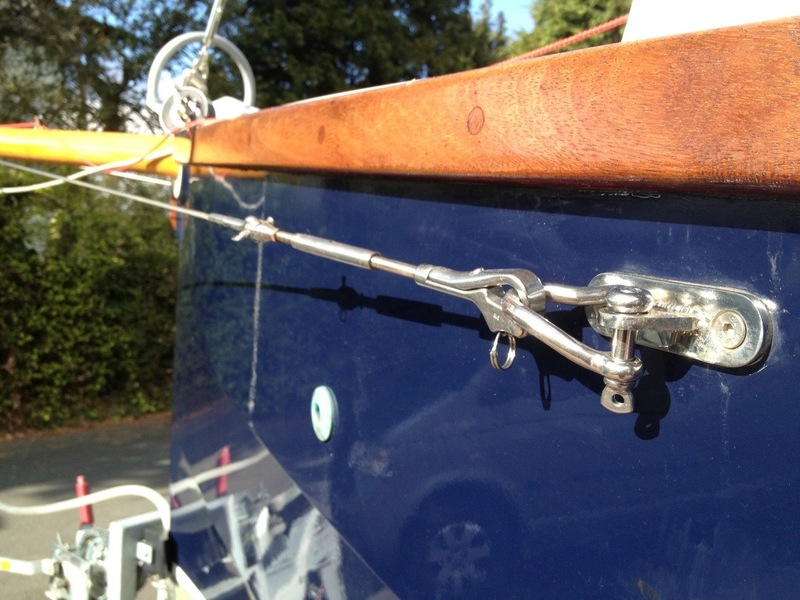 Meanwhile, to make rigging up quicker, I have altered the forestay to add a snap shackle and the bowsprit stays now use pelican clips. Meanwhile, I’m wondering how to route the cables from the VHF antenna and mast head light through the coach roof. My current thinking is to fit the plugs to the port side of the tabernacle. However, it might be neater if the sockets were aft of the tabernacle. 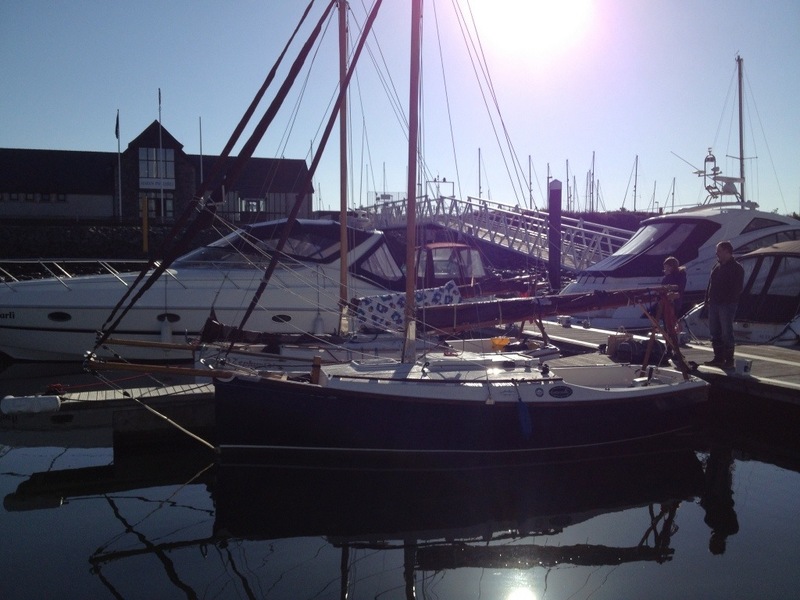 Sadly the fittings are too large to fit in front of the mast. With Aurora on the driveway, a number of mods are underway. 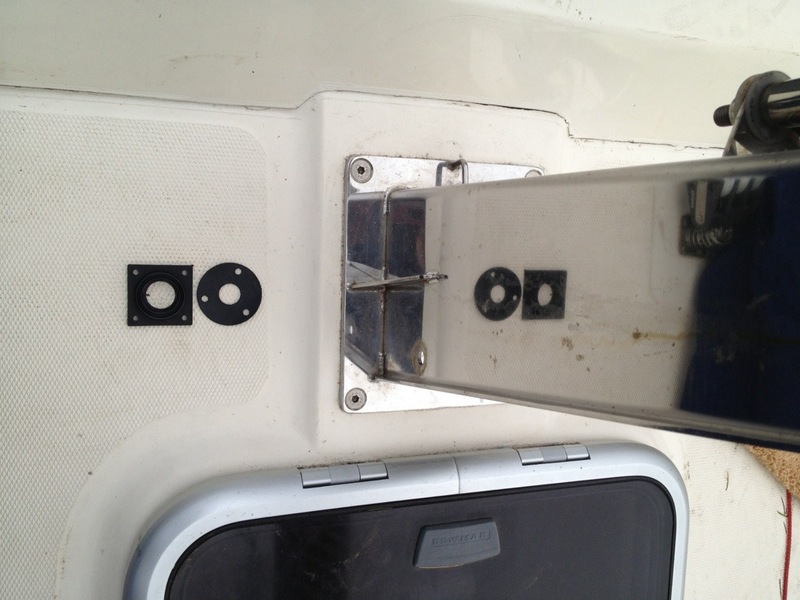 Firstly is the fitting of a fixed VHF radio, secondly, the strakes, coach roof grab rails and Samson post have been stripped of varnish and treated with Deks Olje D1. 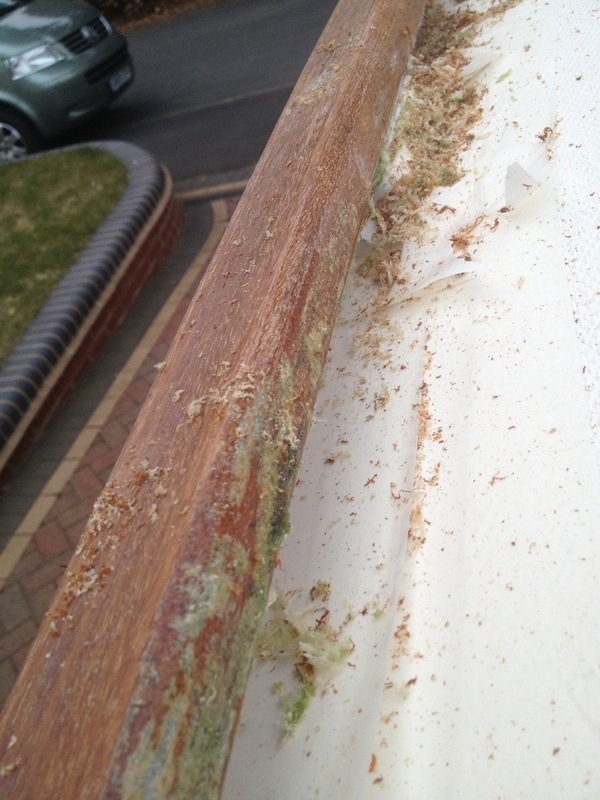 This gives a pleasing matt finish and should mean I don’t need to rub down chipped varnish any more. 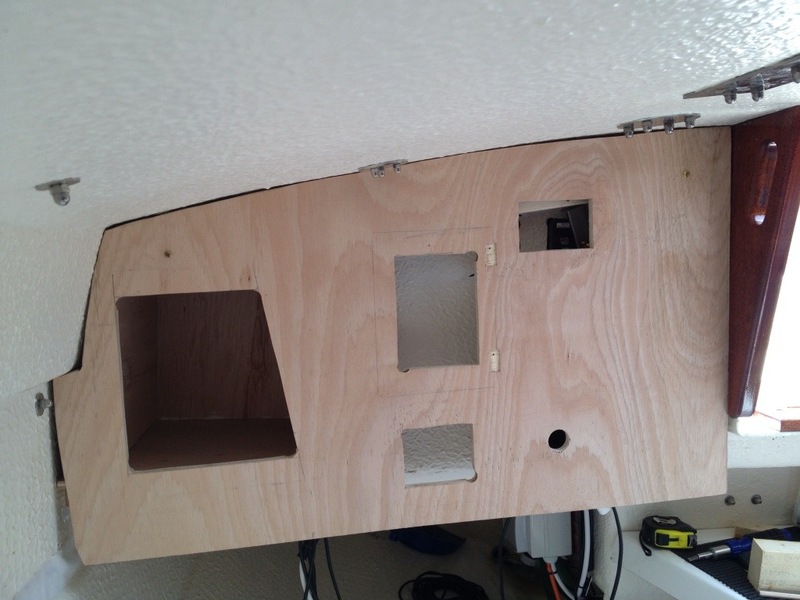 Inside the boat, I have removed the instrument panel. I want to make a new one as my first attempt was a bit crude and I would like to improve the layout, notably to add a bookshelf in the void under the seat. Whilst I am at it, I’ll make a facia on the port side and put some storage in that too. 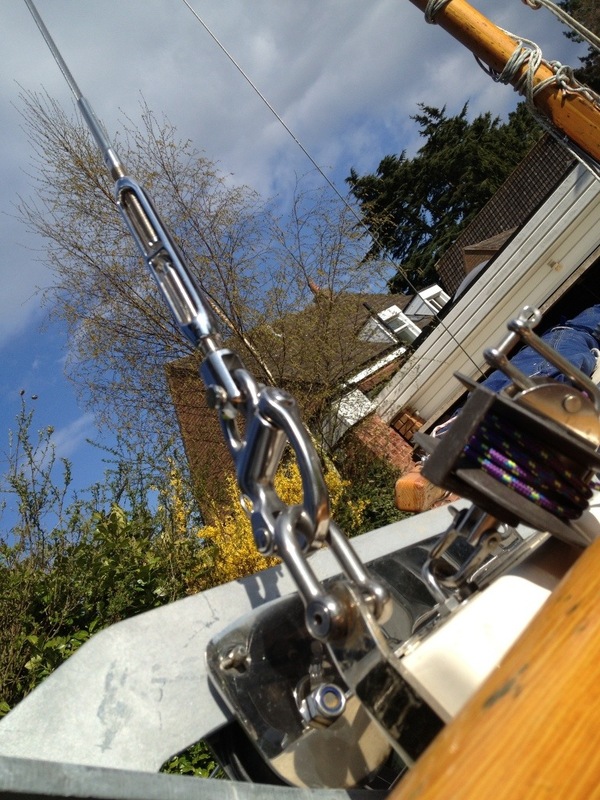 Also still on the to-do list: fit stubby aerial and nav/anchor light to mast head, fit deck sockets for the foregoing and make some alterations to the rigging…. 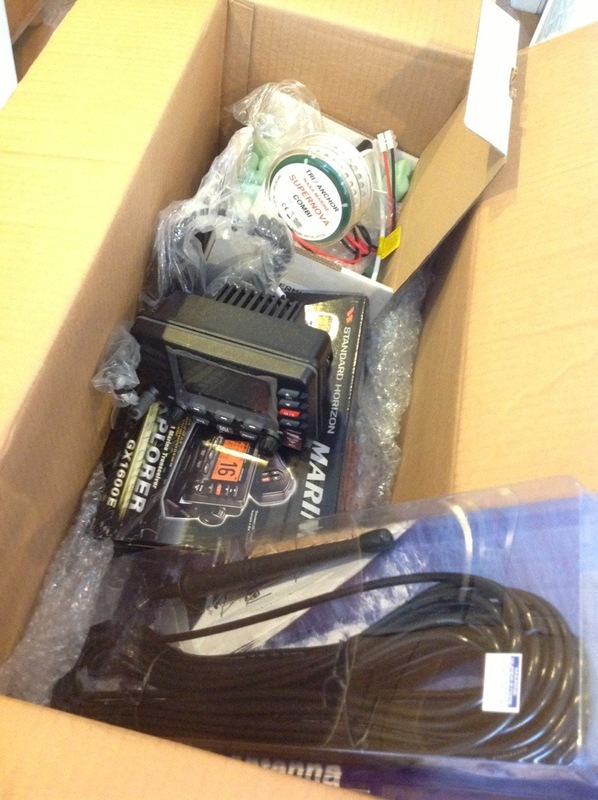 More equipment upgrades in the offing…. 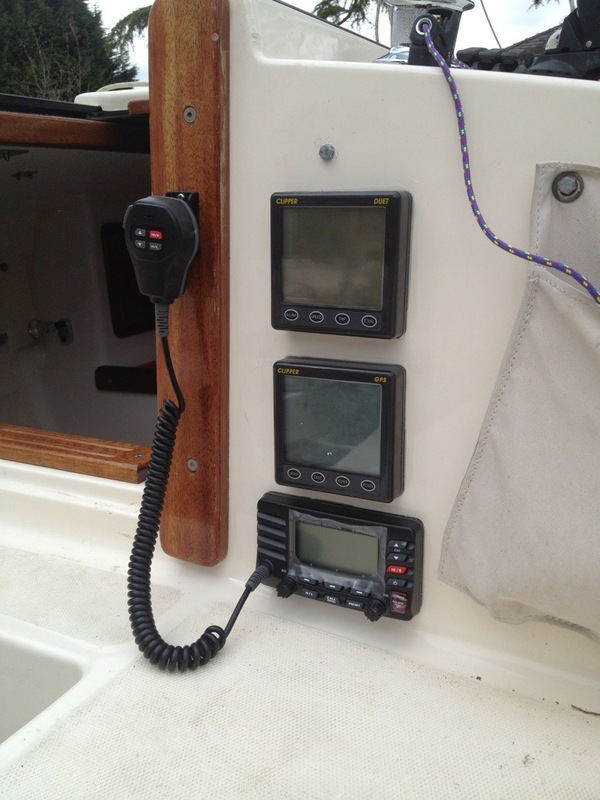 Now Aurora is off the water for a few weeks, I felt a few more upgrades were in order. 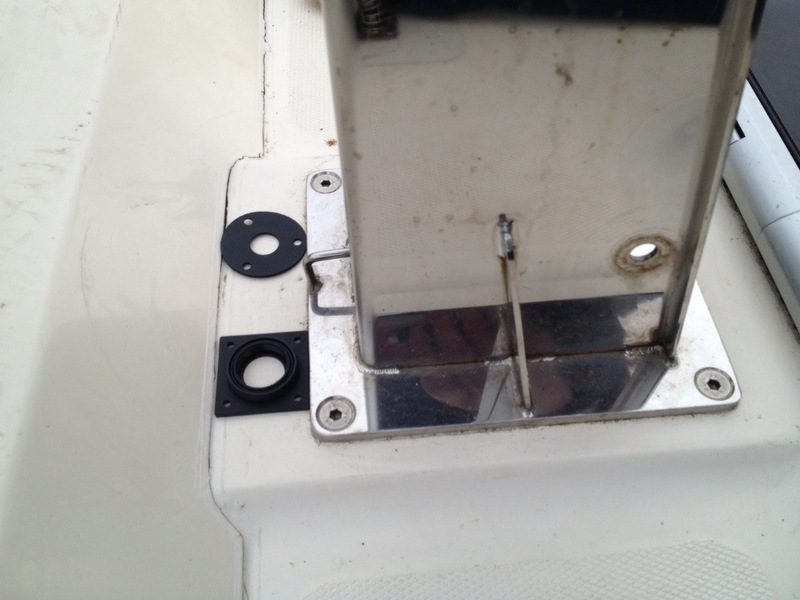 I want to be able to move about at twilight and hopefully spend nights at anchor, so a couple more holes in the deck are called for…. Zephyr and Aurora spent an interesting night alongside the wall. Niki left us and returned to Porthmadog on the train. Russell prepared an excellent meal in his new galley- chicken and chorizo with butter beans in a white wine and creme fraiche sauce with French bread for dipping, followed by pear halves in ambrosia rice pudding. 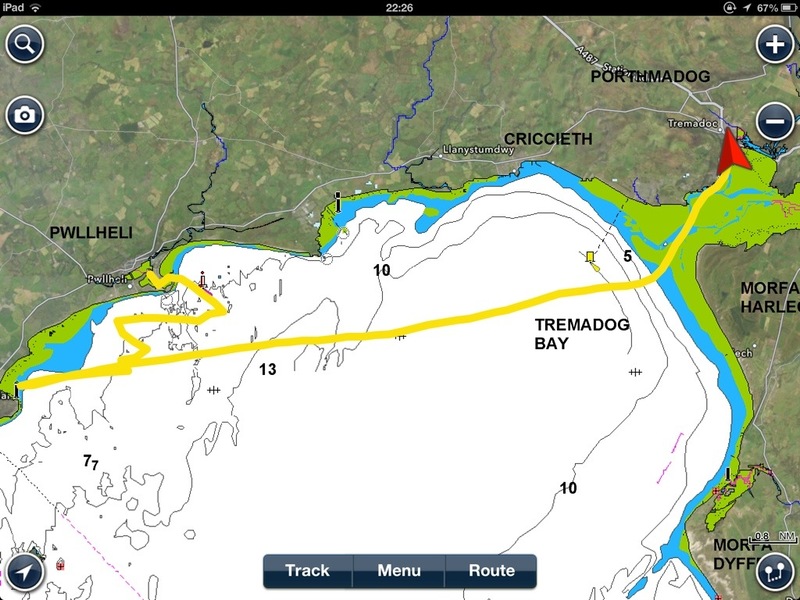 Having taken the ground uneventfully, we decided to get some sleep before the tide returned at about midnight. The wind stayed in the East and had strengthened somewhat. When the water returned, the strong wind had us bouncing around pretty fiercely. I think we would have been more comfortable on a mooring, but I was very glad of the hookup to run a fan heater against the frosty conditions outside. I dozed until we took the ground once more at about 5am and got some more sleep. Niki rejoined us at mid morning and when we had enough water, began our journey back to Tremadog. 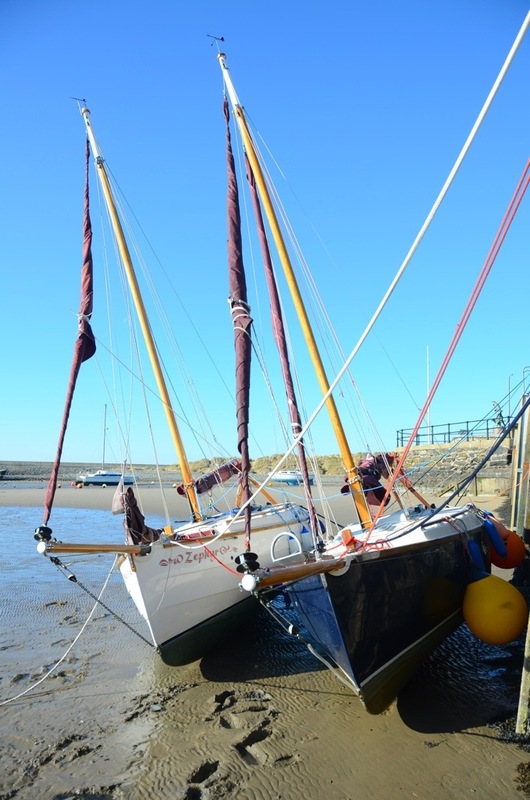 Russell in Zephyr was single handed and the wind strength was quite challenging but we could not haul out at Barmouth and with the wind forecast to strengthen further, if we did not move off then, we would have to wait several days in Barmouth. We made textbook departure from the wall, even in the strong wind pinning us on. Picked up a mooring briefly to wait while Russell sorted Selma technical difficulties, we then sailed off the mooring with the engine running in neutral as a backup. We ran down the channel on main only with 2 reefs in the F5-6 Easterly and avoided the safe water mark, as a local shrimp fisherman had warned us of some lost gear and a great deal of rope in that area! 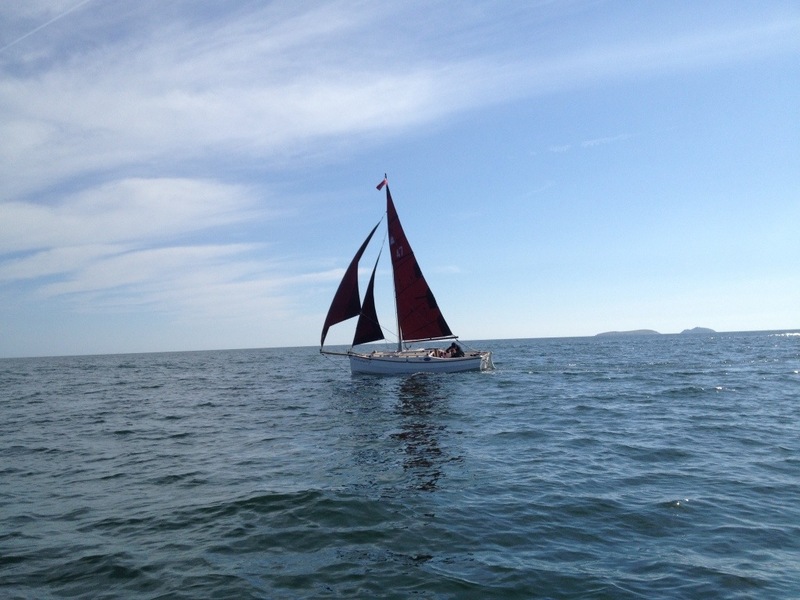 Staysail unfurled we made great time on a close reach close along the shore. 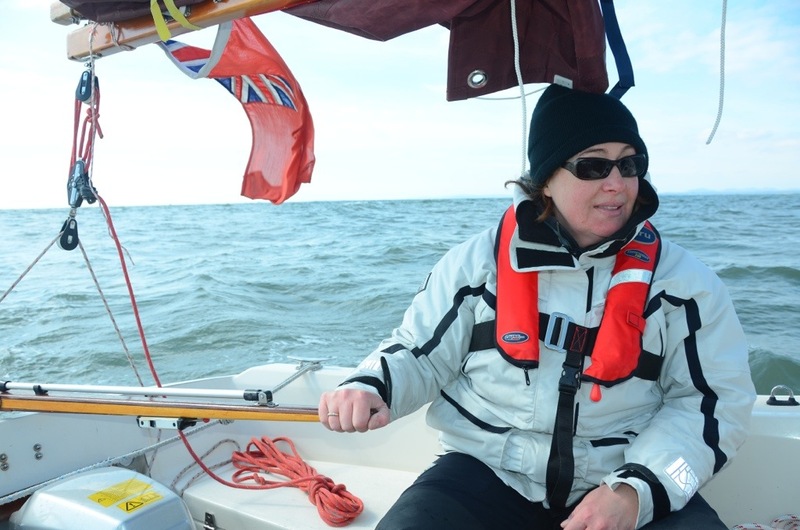 Niki helmed beautifully and Aurora gave great confidence as she took some very big gusts in her stride. 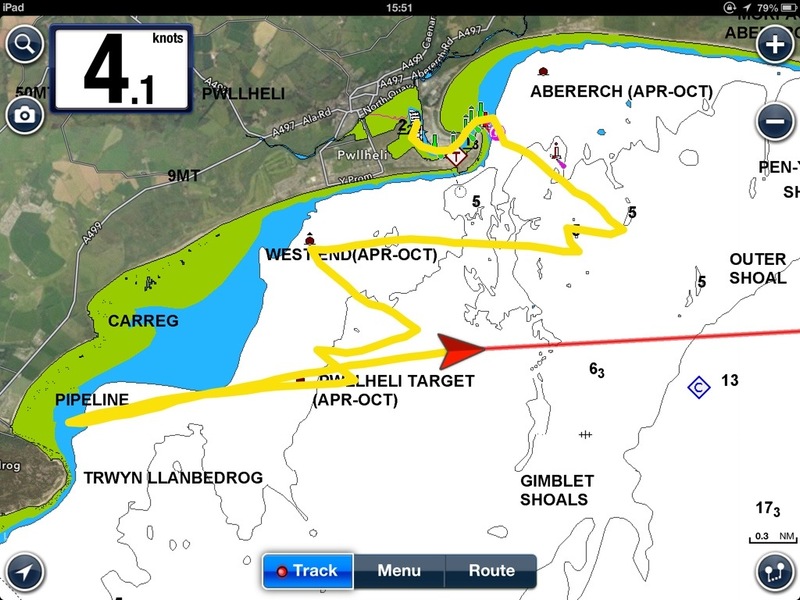 Off Mochras point, we bore away across Tremadog bay straight towards Pwllheli on a broad reach. 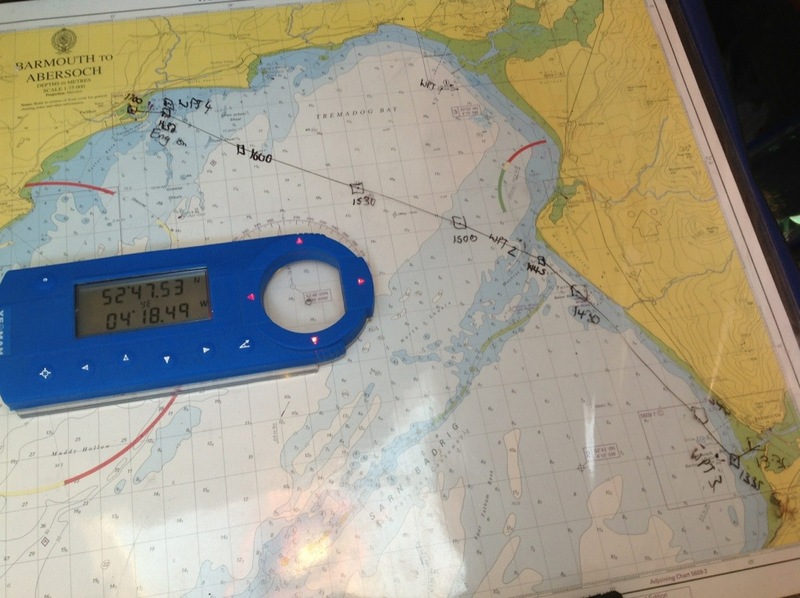 The GPS speed seldom dropped below 5kts and Aurora powered across the swell. 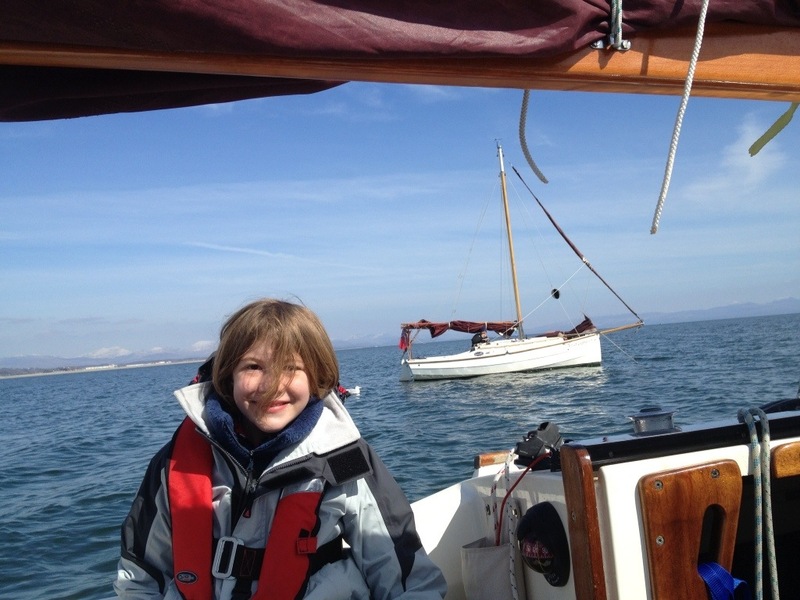 We arrived outside Pwllheli and dropped sails and motored across a nasty bit of swell in the harbour mouth and took moorings on opposite sides of a pontoon in the marina. Sailing in company was enjoyable and seeing Zephyr sailing along close by made a fine sight. 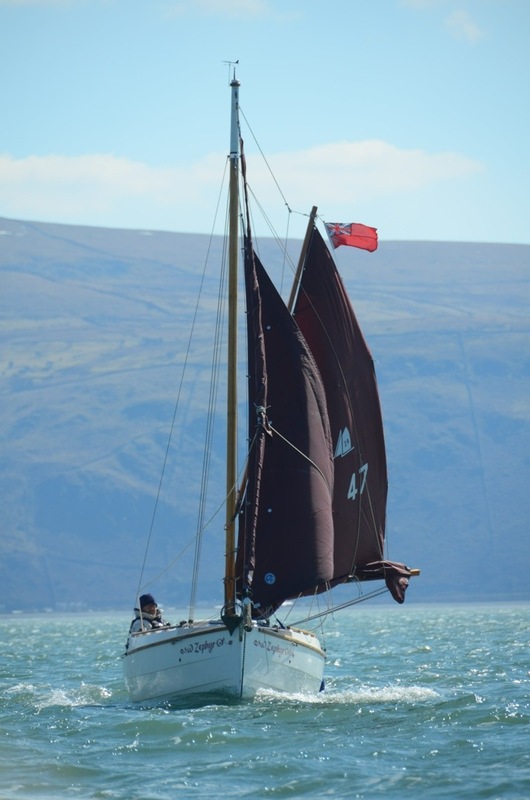 Following the arrival of Zephyr, we decided that the strong Easterlies, although cold, would provide an easy passage South to Barmouth. And so it proved. We motored down the channel with the Easterly F5-6 behind us and after a fair bit of choppy wind over tide at the mouth, turned South towards Mochras Spit. 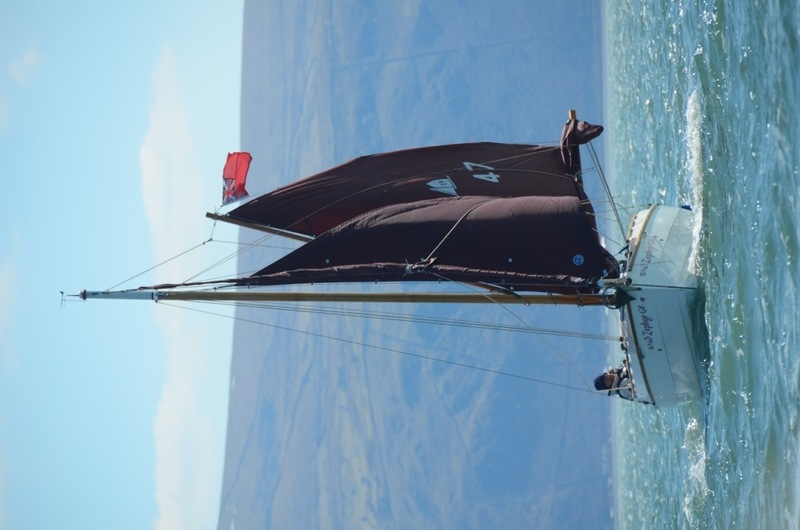 We started with a single reef and staysail, but the gusts were a bit much, so reduced sail further to second reef. A very pleasant leg ensued in the sunshine, admiring the magnificent snow-capped mountains. 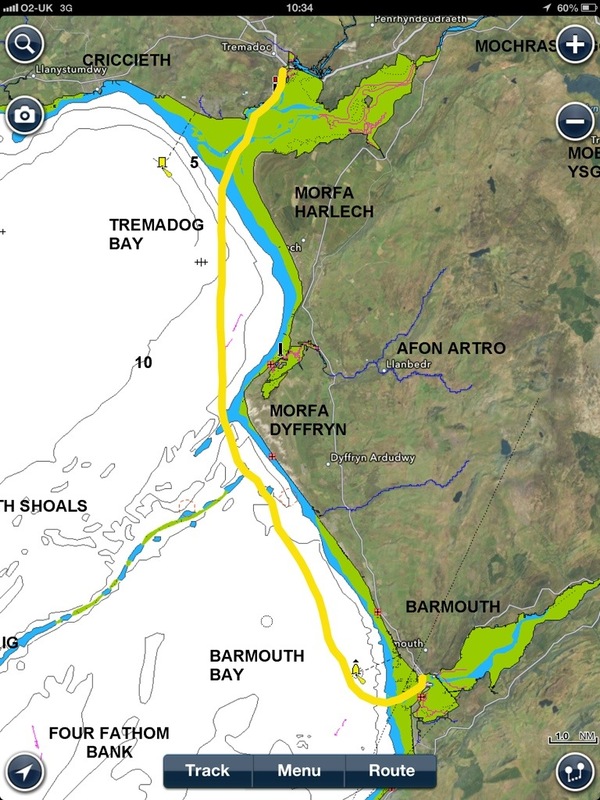 As we turned South East close along the shore of Morfa Dyffryn towards Barmouth, the wind swung South of East and so ended up almost close hauled, much less enjoyable in the stronger cold apparent wind. A prolonged lull encouraged us to increase sail, but we made the mistake of unfurling the Yankee, which gave us more speed but left us overpowered when the full wind returned. 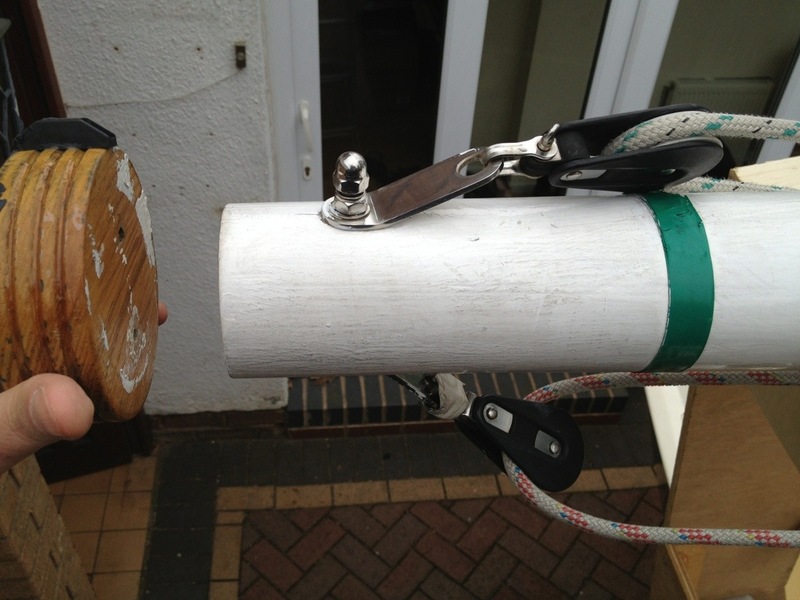 We then had great difficulty furling it away and whilst Niki was fighting the furler and the sail was flogging, the snap shackle securing the sheet to the sail parted company. 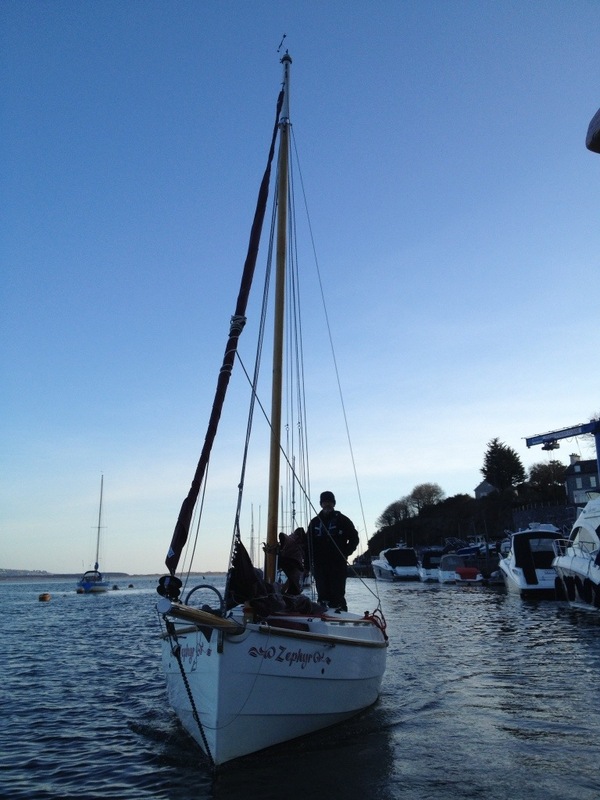 I then had a bracing time on the foredeck bringing the Yankee onto the deck and securing it down with sail ties. Lesson learned: wind more than 15kt, no Yankee! 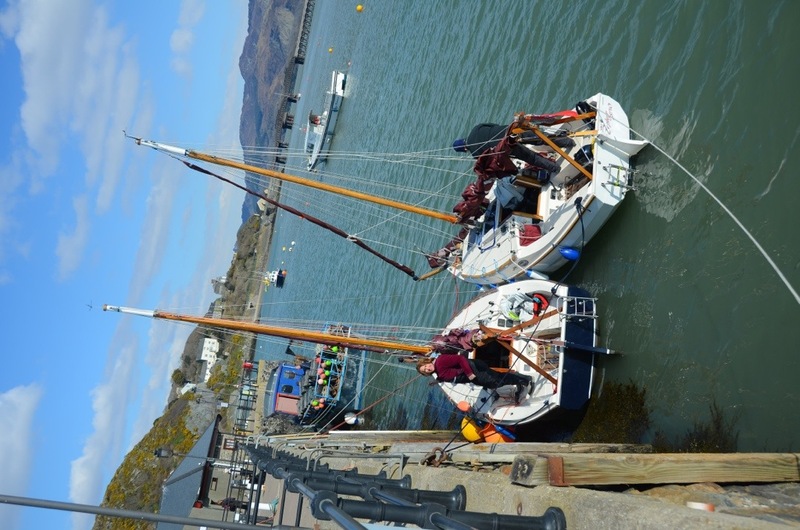 We motored into Barmouth after a journey of 4hr to be greeted by the Assistant Harbourmaster, having radioed ahead. He could not have been more helpful and indeed his assistance was important as the mooring rings were six feet up the wall when we arrived! 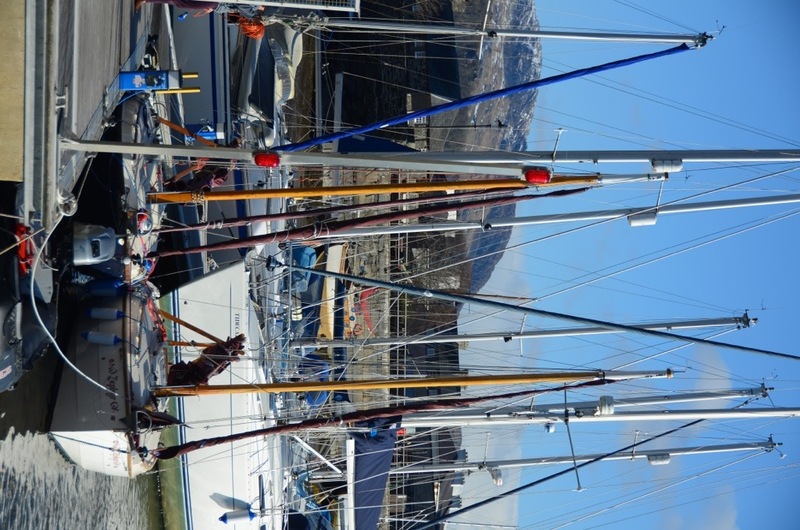 Having lent us large fenders to keep Aurora off the wall, Zephyr rafted onto us.